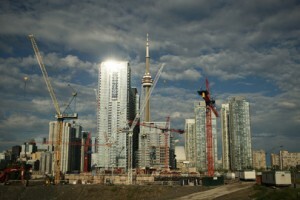 The Toronto Real Estate Board reported 5,984 condominium apartment transactions through the TorontoMLS system in the second quarter of 2013. This result was down by approximately 6% in comparison to the second quarter of 2012. The number of active listings at the end of the second quarter was up year-over-year by less than 2.5%, while new listings were down by slightly more than 4%. The average selling price for condominium apartments in the second quarter was $347,896 – up by 1.7% compared to the average of $342,148 in the second quarter of 2012. The MLS® Home Price Index (HPI) apartment benchmark price was also up by approximately 1% over the same period.